The meanings of signs and the types of symbols shown in the picture of the following Petroglyphs at Chaco Canyon are extremely interesting. Chaco Canyon is located within the San Juan Basin of northwestern New Mexico and the vast Colorado Plateau. Chaco Canyon was inhabited by the Ancient Pueblo People, who are more commonly known as the Anasazi who inhabited Cliff Houses. 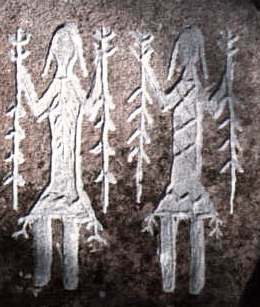 The main figure of the man in the Petroglyph of the man is believed to be a Shaman who is connecting to the spiral symbol which was a powerful sun and life symbol. 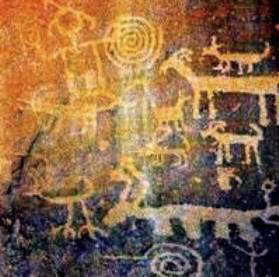 Current theories speculate that the position of the spirals on the Petroglyphs were of major importance and that at certain times of the year a shaft of light, referred to as the 'Sun Dagger', produced a 'light show' on the spiral symbols. These effects occurred the Summer and Winter Solstice and during the spring (vernal) and fall (autumnal) equinoxes and confirmed that these ancient people had significant knowledge of astrological signs. These times of the year were extremely important as they provided bench marks for when crops needed to be planted and when important sun rituals and religious ceremonies took place. For additional information refer to the Hopi Prophecy Rock. The meanings of signs and the types of symbols used by Native American Indians are fully illustrated and can be accessed via the Picture Dictionary of Symbols. The symbols dictionary provides information and origin of many symbols that are depicted in Petroglyphs and includes reference to Native American legends and the mythology of the ancient Mound Builders and the fantastic creatures and monsters that featured in their culture. Discover the vast selection of pictures which relate to the History of Native Americans and illustrate many decorations and tattoos used by American Indians. The pictures show the clothing, tattoos, war paint, weapons and decorations of various Native Indian tribes that can be used as a really useful educational history resource for kids and children of all ages and a means to study their interpretation. We have included pictures to accompany the main topic of this section - Interpretation of Symbol. The videos enable fast access to the images, paintings and pictures together with information and many historical facts. 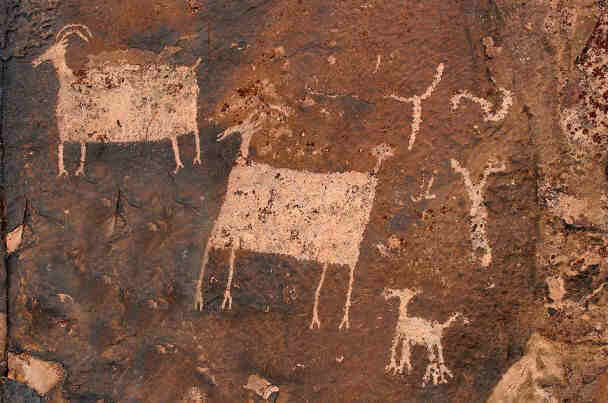 All of the articles, such as the Petroglyphs, can be accessed via the Native Indian Tribes Index.